Sheep Robbery 200 Dollars Reward [re sheep stolen from Edward Abott, Junior, near Russell’s Falls] Dated Jan, 9, 1826. Foolscap folio broadside. Ferguson 1052b. Description based on a photographic copy in TAHO, but Ferguson did not know the whereabouts of the original. Unable to locate the photographic copy either as at 31 Dec. 2016. 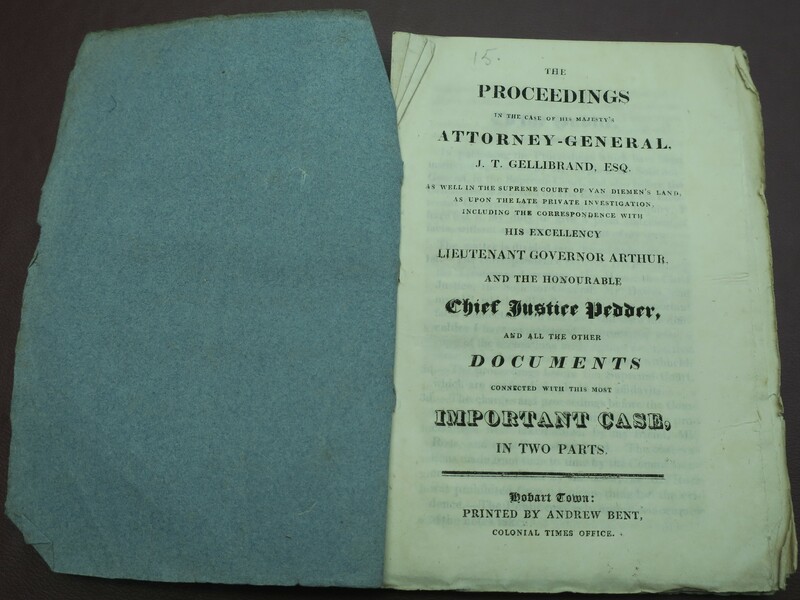 The Proceedings in the Case of His Majesty’s Attorney-General, J.T. Gellibrand, Esq, as well in the Supreme Court of Van Diemen’s Land, as upon the late private Investigation, including the Correspondence with His Excellency Lieutenant Governor Arthur, and the Honourable Chief Justice Pedder, and all the other Documents connected with this most important Case, in two Parts. Hobart Town: Printed by Andrew Bent, Colonial Times Office. 184, ii p., 20 cm. Ferguson 1072. Copies: Allport; Harvard Law library; KCL; ML (2 copies); NSL; TNA (CO280/10 encl in Gellibrand to Bathurst 10 Apr. 1826. Another copy in CO280/92 sent in by William Bryan 13 Nov 1835); University of Otago (Hocken collection); VSL; one copy (ex Hammet) in private collection. Ferguson also lists Sir John Gellibrand. Minutes of the Van Diemen’s Land Company, established by an Act of Parliament, introduced by His Majesty’s Ministers and passed without any single Opposition in any one of its Stages. Together with a List of its Governors, Directors, Auditors, Officers, &c. Hobart Town: Printed by Andrew Bent, at the Tasmanian Patent Press, Colonial Times Office, 1826. 16p., 20.5 x 13 cm. (approx), blue paper covers. Next Week will be published by Mrs. Bent, at the Colonial Times Office, THE whole of the Correspondence between Lord Bathurst, Colonel Sorell, and Edward Curr, Esq. 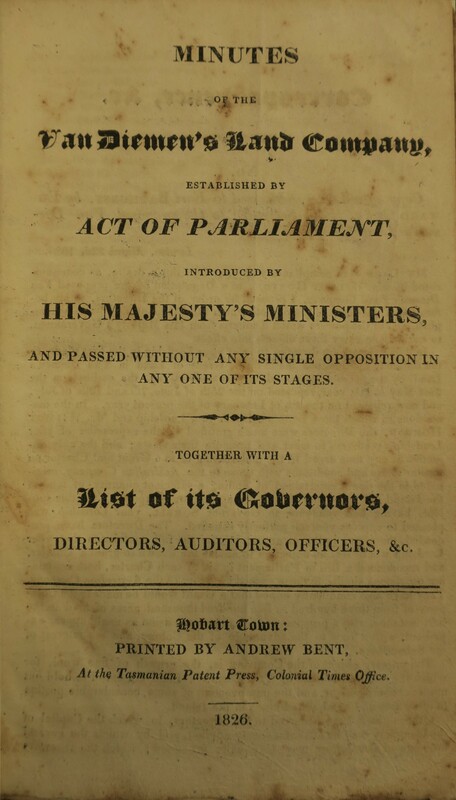 the Secretary, upon the Van Diemen’s Land Company, established by Act of Parliament.-This Pamphlet will also contain other Matters, which together will be found very interesting.-Price, 2s 6d. on delivery. [Second report of the Wesleyan Branch Missionary Society 1825] CT 16 June 1826 announced this ‘has just been printed at our office.’ Not in Ferguson. No known copies. [Proclamation by His Excellency Colonel George Arthur re Matthew Brady and other bushrangers] 1 March 1826. Printed by A. Bent, Colonial Times Office, 1826. Imprint in large black type at bottom of the sheet. 21 ¾ x 15 ½ in. Ferguson 1093c. Copies: TAHO GO33/1/1 p. 405. [Circular letter transmitting copies of the Colonial Times, Apr. 3 1826] Copy seen is addressed (in Bent’s hand) to Lord Bathurst. As the letter was printed so as to have the addressee’s name inserted by hand, there were probably other recipients (TNA CO280/9 f. 29)[Currency Conversion Table] Advertised in CT 17 Nov. 1826. “A TABLE, by which Sterling Money of any number of Spanish Dollars, from 1 to 1000, may be seen at one view at the rate of 4s. 4d. each, to be had at the Times Office. Price, 6d.” No copies.